What is Omnitracs Roadnet Anywhere? Omnitracs Roadnet Anywhere is a route building and optimization software that helps businesses create routes with 100% accurate travel times. The solution does this by building on information garnered from historical traffic patterns. With Omnitracs Roadnet Anywhere, businesses can also apply custom rules with regard to their deliveries. This leads to more efficient driving trails and faster delivery times. On top of that, all routing information is stored in a central system that can be accessed by the entire time, letting them see for themselves what roads they should take. Moreover, Omnitracs Roadnet Anywhere assists businesses in lowering their delivery costs. That is because the software shows them how much it would cost for a fleet to utilize one route over another, letting them choose the best and most affordable option. With Omnitracs Roadnet Anywhere, fleet owners and managers can send their vehicles to different paths. The software is capable of building and storing multiple routes, so users do not have to create new courses each time. This is a time saver and helps businesses make their operations more efficient. Omnitracs Roadnet Anywhere also considers customer information such as their business hours and preferred delivery times in building routes. This leads to better relationships with customers and saves time by ensuring that drivers are able to offload their cargo upon arrival at the destination. Omnitracs Roadnet Anywhere offers businesses flexibility when it comes to building their directions. The solution can be utilized to manage different types of vehicles and to create routes that are suitable for their capacities while making certain they stay within the budget. Omnitracs Roadnet Anywhere makes sure customers get their goods at the right time. When the software creates routes for fleets to follow, it takes into account traffic history, allowing it to provide optimum directions. This leads to fewer traffic jams encountered and less time wasted idling on a street. In case a business receives a late order or a priority order, they can use Omnitracs Roadnet Anywhere to suggest the best route. This way, they can deliver their customers’ goods with haste. Understanding how routes impact operations is key to better business strategies. That is why Omnitracs Roadnet Anywhere is equipped with reporting tools that let users analyze their current and old routes, compare them, and find issues that they can solve or improve. If you are interested in Omnitracs Roadnet Anywhere it could also be beneficial to investigate other subcategories of Best Fleet Management Software collected in our base of SaaS software reviews. Since each company has unique business wants, it is advisable for them to desist from searching for a one-size-fits-all faultless software solution. Needless to say, it would be useless to try to find such a system even among market-leading software solutions. The clever thing to do would be to jot down the various important aspects that need consideration such as key features, finances, skill levels of staff members, company size etc. Then, you should do your research thoroughly. Read some Omnitracs Roadnet Anywhere reviews and look into each of the other solutions in your shortlist in detail. Such in-depth research can ensure you reject ill-fitting applications and select the system that offers all the elements you require for business success. How Much Does Omnitracs Roadnet Anywhere Cost? We realize that when you make a decision to buy Fleet Management Software it’s important not only to see how experts evaluate it in their reviews, but also to find out if the real people and companies that buy it are actually satisfied with the product. That’s why we’ve created our behavior-based Customer Satisfaction Algorithm™ that gathers customer reviews, comments and Omnitracs Roadnet Anywhere reviews across a wide range of social media sites. The data is then presented in an easy to digest form showing how many people had positive and negative experience with Omnitracs Roadnet Anywhere. With that information at hand you should be equipped to make an informed buying decision that you won’t regret. 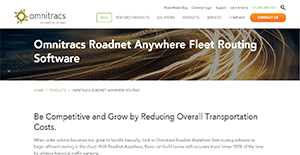 What are Omnitracs Roadnet Anywhere pricing details? What integrations are available for Omnitracs Roadnet Anywhere? If you need more information about Omnitracs Roadnet Anywhere or you simply have a question let us know what you need and we’ll forward your request directly to the vendor.